Fingers numb? Wrist, hand hurt? Don’t blame computer. Feel persistent burning, tingling or numbness in the fingers, wrist pain and weakness of the hand? Don’t blame your job or time spent on your computer keyboard, mouse or handheld games and phones. Feel persistent burning, tingling or numbness in the fingers, wrist pain and weakness of the hand? Don’t blame your job or time spent on your computer keyboard, mouse or handheld games and phones, says noted orthopedic surgeon Alejandro Badia MD. 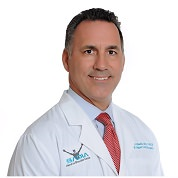 “Carpal tunnel syndrome is unrelated to repetitive activities or constant use of high-tech gizmos,” says Dr. Badia, founder of Badia Hand to Shoulder Center and OrthoNOW®, who specializes in treating injuries of the upper limbs – wrist, fingers, elbow and shoulder. Repetitive motion may aggravate the problem, but carpal tunnel syndrome has multiple causes, such as wrist-canal anatomy, obesity, advancing age, pregnancy, menopause, wrist trauma, presence of underlying nerve-related and inflammatory diseases like diabetes and rheumatoid arthritis, or other conditions, including hypothyroidism and kidney failure, Dr. Badia says. To date, studies have failed to show conclusively any definitive relationship between repetitive motion and carpal tunnel syndrome, Dr. Badia says, adding that the “myth” of such a relationship has prompted misdirection of billions of dollars into workers’ compensation to treat a condition that commonly occurs in the general population and is not due to on-the-job requirements. Carpal tunnel syndrome develops when the median nerve, running from forearm to hand through the narrow carpal tunnel on the wrist’s palm side, becomes pinched and inflamed, explains Dr. Badia. The carpal tunnel is composed of bone and ligaments and serves as passageway for the median nerve and the tendons controlling the fingers. Symptoms of the neuropathy – burning, tingling, and numbness in the fingers and palm of the hand, wrist or forearm pain and decreased hand strength – begin slowly, worsening over time. Experts say some individuals may have an “innate predisposition” for carpal tunnel syndrome because their wrist canals are anatomically narrower. The National Institutes of Health reports women are more than three times likely than men to develop the affliction, likely because of tendon sheath changes that are affected by estrogens, worsening in the perimenopausal years and typically seen during 3rd trimester of pregnancy, although usually transient. CTS is very rare in younger people, and when seen, is likely due to narrow anatomy of the carpal canal relative to tendon diameters. The good news: treatments for carpal tunnel syndrome have advanced, and the problem can be effectively resolved without loss of hand function, Dr. Badia says. Initial treatment tends to be conservative in nature, involving wearing of wrist splints at night, high doses of anti-inflammatory medications, Vitamin B6 ingestion, corticosteroid injections on rare occasion while physical therapy has been shown to have minimal effectiveness. However, if the problem persists or nerve compression is severe the hand specialist will usually recommend a minor outpatient procedure, Dr. Badia says. “With surgery, the ligament that serves as the roof of the carpal tunnel is divided to increase space and take pressure off the nerve. The procedure can be performed under local anesthesia,” Dr. Badia says. “A most recent treatment breakthrough is endoscopic release, in which the surgeon divides the carpal tunnel ligament through a tiny cut in the crease of the wrist without having to make a larger, open incision,” he says. The nerve and tendons are protected while the division of the compressing ligament is visualized on a large monitor via the endoscope, avoiding any soft tissue disruption that would lead to post-op discomfort. Patients can use the hand immediately, only avoiding heavy manual labor or sports for several weeks. Minimal to no rehab is even necessary. Be cautious of hand position during sleep. Maintaining the hand below heart level allows fluid to pool in the wrist canal and may increase risk. The wrist typically bends during REM cycle sleep (dreaming) putting more pressure on the median nerve. A wrist splint will avoid that during sleep. Use tools, pens or other items with a more relaxed grip. Be aware of posture while walking or sitting; keep shoulders squared. Hunching places strain on arms, wrists and hands. Avoid bending the wrist excessively in flexion or extension for prolonged periods. Take breaks when doing any intensive activities involving hands or wrists.